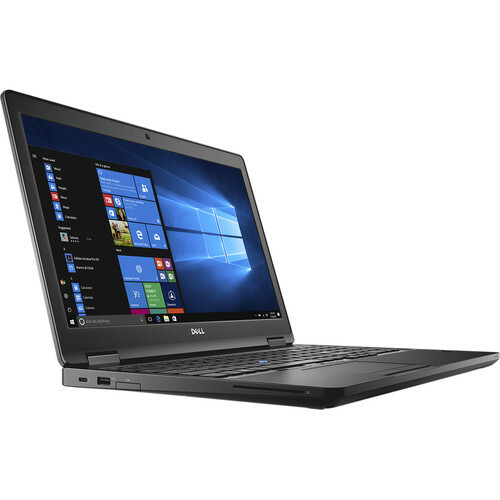 Designed with a compact form factor and powerful performance for demanding applications, the 15.6" Precision 3520 Mobile Workstation from Dell is well-suited for those on-the-go users who are working with 3D imaging, rendering, and other intensive applications. It is powered by a 2.7 GHz Intel Core i7-6820HQ Quad-Core processor that allows you to run multiple applications simultaneously. The processor also features a boost speed of up to 3.6 GHz and the system's 8GB of 2400 MHz DDR4 RAM allows the computer to quickly access frequently used files and programs, as well as help to ensure efficient multitasking. If you'd like to upgrade the system's memory, up to 32GB is supported over two 260-pin SO-DIMM slots. The 15.6" IPS display features a Full HD 1920 x 1080 resolution, a 16:9 aspect ratio, LED backlighting, 300 cd/m2 brightness, and viewing angles of 160°. The dedicated NVIDIA Quadro M620 graphics card has 2GB of GDDR5 RAM and delivers a sharp, clear picture. You'll also be able to output video to an external display using the built-in HDMI and VGA outputs, as well as DisplayPort via USB 3.0 Type-C.
For storage of your files, this Precision 3520 is equipped with a 500GB 7200 rpm SATA 2.5" / 7mm hard drive, and there is also an empty M.2 slot for additional internal PCIe or SATA storage. If you want to add external storage, optical drives, memory card readers, and more, the Precision 3520 offers one USB 3.0 Type-C port, which can output up to 15W of power, and three USB 3.0 Type-A ports, one of which doubles as a charging port. Gigabit Ethernet and 802.11ac dual-band Wi-Fi are built-in for wired and wireless networking and Bluetooth 4.1 technology will also allow you to connect additional compatible peripherals. A built-in SD 4.0 card reader supports SD/SDHC/SDXC UHS-II flash media and lets users download content from their digital camera. Other integrated features include a 720p webcam, dual-array microphones, and stereo speakers with 2W per channel. The 15.6" Precision 3520 Mobile Workstation includes a power cord, a 130W AC adapter that operates using 100-240 VAC at 50-60 Hz, and a 4-cell / 68Wh lithium-ion polymer battery with ExpressCharge. While the installed operating system is Windows 7 Professional (64-bit), a Windows 10 Professional (64-bit) license and media are included at no additional cost. Protection is provided by a limited 3-year hardware warranty with onsite/in-home service after remote diagnosis. The card reader supports SD, SDHC, and SDXC cards. The Ultra High Speed Phase II (UHS-II) bus design was added for the SD 4.0 spec, which consists of an additional design enhancement with connector interface modifications to increase performance. UHS-II specs define bus architecture for maximums of 156 MB/s to 312 MB/s using the four-lane (two differential lanes) UHS-II bus and its additional row of physical pins. The Precision 3520 has one USB 3.0 Type-C port and four USB 3.0 Type-A ports that operate at speeds up to 5 Gb/s and can be used to connect USB-compatible peripherals such as external storage, optical drives, printers, memory card readers, and more to your system. One USB 3.0 Type-A port is equipped with USB PowerShare technology. This allows you to select how much of the battery's charge can be used to charge external devices. If you set the USB PowerShare to 25%, the external device is allowed to charge until the laptop battery reaches 25% of its full capacity, so 75% of the Precision's charge is used up. If the system is running on battery power alone, PowerShare will only power devices while the system is in a low power state (standby mode). This option lets you set the maximum power that can be drawn from the USB Type-C connector, either 7.5W (default) or 15W. There are five battery charging configurations available, including Adaptive, Standard, which fully charges the battery at a normal rate, ExpressCharge, which charges the battery over a shorter period of time using Dell's fast charging technology, Primarily AC use, and Custom. If Custom is selected, you can also configure charging start and stop times. Free with your Precision workstation, the Dell Precision Optimizer takes the guesswork out of customizing settings and automatically tunes your workstation to run popular Independent Software Vendor (ISV) applications at the fastest speeds possible. It features centralized management with Microsoft SCCM and KACE, simplified systems management to improve system reliability, detailed analytics and smart notifications to proactively address resource bottlenecks, certified graphics driver downloads, and Radeon ProRender ray-tracing plug-ins to render photorealistic images. Precision Workstations are tested to ensure that the high-performance applications you rely on every day run smoothly. Dell ISV-certifications cover the most popular independent software applications. Box Dimensions (LxWxH) 21.7 x 13.7 x 3.1"